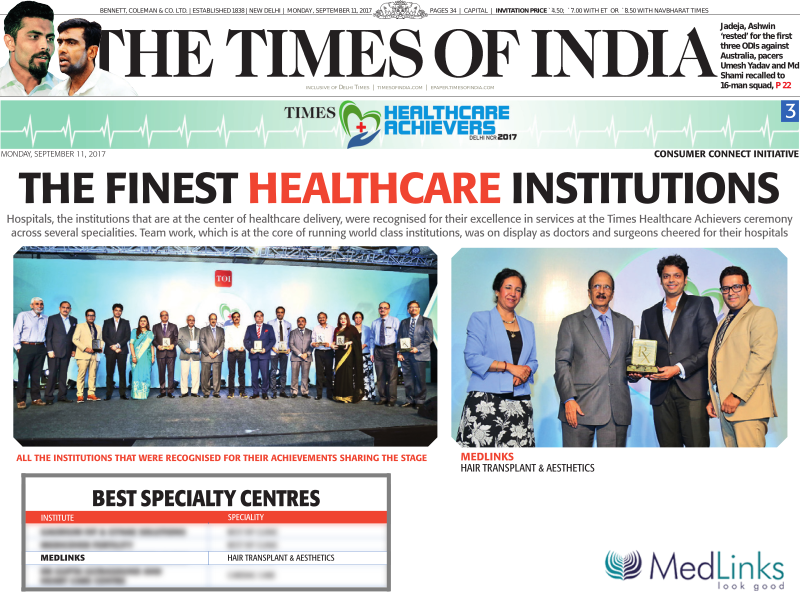 Times Healthcare Achievers Awards is a one of a kind event organised by Times of India with Medium Healthcare Consulting to acknowledge and honour doctors and hospitals in Delhi NCR for their excellence in services. MedLinks Hospital, a hair and skin treatment centre in Safdarjung Enclave, New Delhi, has been awarded as the best Hair Transplant and Aesthetic centre in Delhi NCR. The award was received by Dr. Pankaj Chaturvedi and Dr. Gaurang Krishna, the two Medical Mavericks of MedLinks. Both the surgeons were pleased to receive the award which is another feather in their cap. MedLinks is one of the most celebrated names in the field of Hair Transplant and Aesthetics Care. The centre is greeted for its prominent dermatologists, state-of-the-art technology, premium quality services and unparalleled contribution to the community.